Cleaning your braces is easier than you think! Be glad: Braces don’t mean any more work brushing, just a different style. Special toothbrushes, dental floss and also water jets can help you. You should always brush your teeth and braces after each meal. As we said, it’s no big deal. 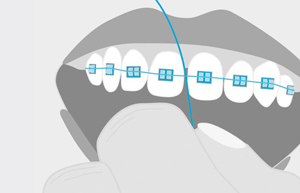 Braces without rubber bands actually make it really easy. It is best to use a soft toothbrush with a large head and toothpaste with fluoride. Now start to brush each tooth surface. Of course, you mustn’t forget the areas above, below and between each brace. Brush your top teeth from top to bottom, and your bottom ones from bottom to top. Next you use an interdental toothbrush to scrub all the areas clean that you didn’t get to with the big one. Brush so the bristles spread out between the braces, wires and rubber bands. To get everything really clean, you should brush each tooth surface about 10 times. So no stress: It usually takes 3-5 minutes max! Does it really need to be after each meal? It may seem tedious at the beginning, but you’ll get used to it fast and you are doing yourself a big favor. Once the braces are removed poor oral hygiene can result in decalcification. No thanks! Your toothbrush now has more work to do and wears out faster. Best swap the brush as soon as its bristles fray. Optical trick: Tooth dye tablets make all your tooth surfaces show up much better. If you’ve got a dental water jet, use it to eliminate rough food particles before brushing. 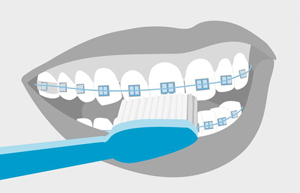 Crystal clear: Systematic dental care is really important if you wear braces. Professional tooth cleaning at the dentist helps you protect your teeth even better. This cleaning removes plaque, polishes your teeth and puts fluoride on the surface of your teeth to strengthen them. Dental floss is a cool tool for removing food particles and plaque from the spaces between your teeth. You think it’s not so easy with braces? Threading normal dental floss under the wires can be tricky. It is easier using dental floss with a reinforced end. If you have threaded dental floss under the wire, just slide it up and down the tooth’s surface. Be sure not to put too much pressure on the archwire. Finally, you just need to carefully clean all the areas around the rubber bands – presto! Not yet sure? 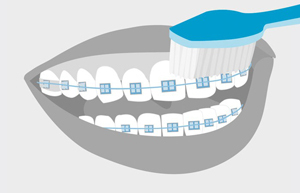 Your orthodontist will be glad to show you the right way to use dental floss with braces.